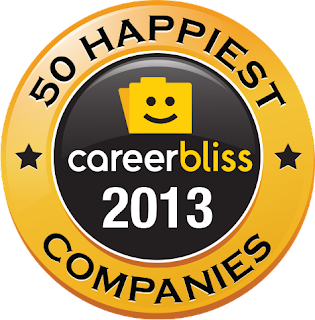 CareerBliss has revealed the top happiest companies in 2013. They analyzed thousands of independent employee-submitted reviews. The reviews ask professionals to rank how they feel about key happiness factors at work, such as the culture of the company, compensation and people you work with. “Being able to be truly happy at work is one of the keys to being happy in life,” says Heidi Golledge, CEO and Co-founder of CareerBliss. “CareerBliss recognizes companies that excel at providing happy work environments since it is a vital part of the CareerBliss mission to foster rich and rewarding work cultures for everyone.” Check out the full happiest companies below! Looking for a happier job in 2013? Here's the top 50 happiest companies in America by rank. *Bliss Score ranks on a scale of 1-5 and evaluates a combination of 10 key factors that impact overall workplace happiness.